This custom set is adapted from our Mount-Hood-inspired Peak invitation, but without the peak. Posted in wedding invitations and tagged with soft white somerset, tungsten, dust, envelope liner, arturo envelope, website card, Burgues Script, garamond caps. July 27, 2017 by Travis Friedrich. For fellow Portlanders Nathan and Liene, we created a customized variation on our Petal invitation. We kept the round corners and multi-tone orchid art, but changed the fonts, orientation, and inks. Posted in wedding invitations and tagged with purple, flower, floral, berry, tungsten, neutra, satisfaction, rounded corners, 300g, pearl white. August 30, 2016 by Travis Friedrich. For us, 2015 has been the year of foil. Check out these awesome foil stamped employee recognition cards we printed for Canada's Ian Martin Group. All six sets were printed with gold foil on 600g Ecru Lettra paper, then finished with gold edge paint. Posted in business stationery and tagged with foil, tungsten, gold, edge painting, 600g, ecru white. May 5, 2015 by Travis Friedrich. David and Allyson's invitation set was based on Petal, which features an original illustration by Parklife Press. The text, set in all-caps Gill Sans, is set off by the lightly-flourished script of their names. The asymmetry of the single, flowering branch — printed in tungsten and blush inks — provides a fresh and cheerful balance to the clean and modern design. The branch design from the invitation was carried through on the RSVP card. 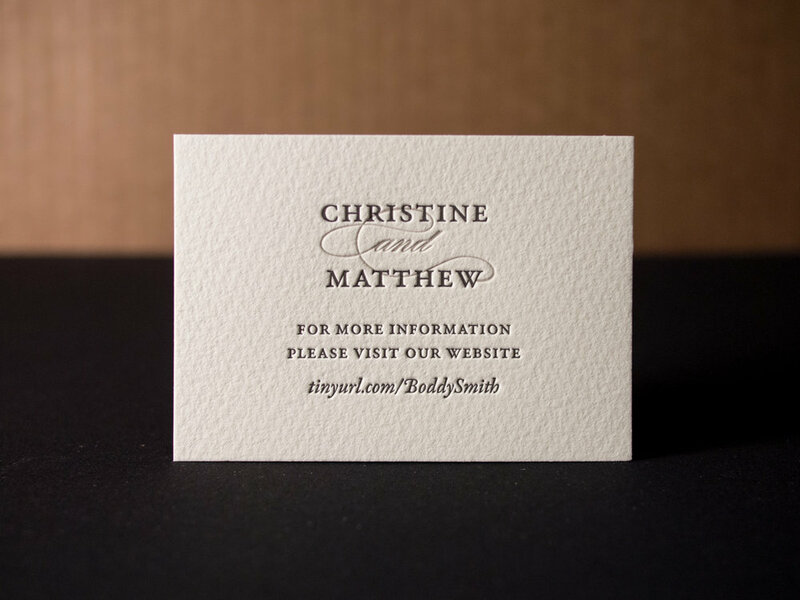 Letterpress is typically created with solid areas of ink impressions using individual, premixed colors. But here, by using halftone screens (read our post about letterpress and the halftone process here), three shades of pink were achieved using only one ink. This branch of blooming buds would still be pretty with solid, 100%-strength blush ink, but the design would lack depth; it wouldn't be as delicate, or as interesting. Posted in wedding invitations and tagged with pearl white, 300g, tungsten, blush, petal, halftone screen. March 13, 2014 by Sarah Arneson.